Russia is the largest country in Europe, with 6.6 million square miles (17 million square kilometers). It is 1.8 times the size of the United States. Russian land extends to the Arctic Ocean in the north. Russia shares borders with China and Mongolia to the south, and Ukraine, Latvia, Belarus, Lithuania, and Finland to the west. About three-fourths of the land is arable (able to be farmed), although the output from farms decreased during the 1980s and 1990s. After the Union of Soviet Socialist Republics (USSR) broke apart in 1991, the Russian government started a program to encourage small farmers. From 1991 to 2001 about 150,000 new small farms were established. Russia has a history of a diet based on crops that can thrive in cold climates, such as grains (rye, barley, buckwheat, and wheat), root vegetables (beets, turnips, potatoes, onions), and cabbage. Ivan III (ruled 1462–1505) brought Italian craftsmen to Russia to build public buildings. These craftsmen introduced pasta, frozen desserts (gelato and sherbet), and pastries to the Russian diet. Peter I (ruled 1682–1725), known as "The Great," included a French chef in his court. It was during his reign that Russians began to serve meals in courses, rather than to serve all the food at once. From that time until the Russian Revolution in 1917, many wealthy Russian families employed French chefs. When French chefs returned home to France, they introduced popular Russian dishes to the people of Europe. The Salade Russe, known in Russia as Salat Olivier or Salad Rusky was created during the era of Nicholas II (in power until 1917) by a French chef. Peel the potatoes, cut them in half, and place them in a saucepan. Cover the potatoes with water, heat over high heat until the water boils, and simmer until the potatoes can be pierced with a fork (about 15 to 20 minutes). Drain and allow to cool. Repeat the same process with the two carrots. When both are cooled, cut into cubes and place in a large mixing bowl. Add remaining ingredients (except mayonnaise) and toss gently to combine. Stir in 2 Tablespoons of mayonnaise, or enough mayonnaise to hold ingredients together. Arrange clean, dry lettuce leaves on a platter, and mound the salad in a pyramid shape in the center. Spread more mayonnaise over the top of the salad like frosting. Garnish with hardboiled egg slices. From the time of the Russian Revolution in 1917 until 1981, all of the restaurants in Russia (then part of the USSR) were owned and operated by the government. Most stores were run by the government, too. Due to food shortages and inefficient store management, families had to stand in long lines to buy bread, meat, and other basic food items. In 1981 President Mikhail Gorbachev began reforms that culminated in the 1991 breakup of the USSR and the beginnings of a democracy. But the sale and purchase of food was still regulated by the government as of the end of the twentieth century. Fresh bread is sold and carried home unwrapped. It is not uncommon for a Russian family to eat three or four loaves of bread each day. or four loaves of bread a day. Also popular are bliny (thin pancakes), and a variety of savory and sweet pies called either piroghi (large pies) or pirozhki (small pies). They are usually filled with fish, cheese, jam, cabbage, mushrooms, chopped hard-cooked eggs, or meat. The possibilities are unlimited. These pies are served alone or with soup at lunch. Hot sweetened tea, called chai, is served frequently from a samovar (large brass boiler) that heats water and steeps the tea leaves to form a concentrated mixture. Russians eat more fish than most other cultures because, under the Russian Orthodox Church, many days of the year were fasting days and fish was the only meat allowed. Sturgeon is the favorite fish of the Russians, from which black caviar (fish eggs) is collected. Kissel , a piece of stewed fruit thickened with cornstarch with milk poured over it, is a traditional dessert. Bliny is a traditional Russian dish that is eaten in great quantity during Maslyanitsa (Butter Week, the Russian equivalent of Mardi Gras), the last week before Lent. Good bliny must be very thin, the thinner the better. Bliny may be served with sweet or savory filling or with butter, sour cream, caviar, fresh fruit, or smoked fish. Beat eggs until foamy in a medium mixing bowl. Add sugar, salt, and milk. Add flour and mix well until no lumps remain. Add vanilla. Pour a little vegetable oil into a small frying pan. Heat the pan over medium heat. Using a ladle, pour a very thin layer of batter into the pan. Cook until edges begin to curl and brown, and then carefully turn to brown the other side. Serve with filling (recipe follows). May also be served with butter, jam, sour cream, or fresh fruit. Thaw frozen berries, and place into a saucepan. In a measuring cup or drinking glass, dissolve cornstarch completely in ¼ cup water. Stir cornstarch mixture into berries and heat slowly until the berry mixture thickens. This recipe involves three steps: making the dough, making the filling, and assembling the pies. Make dough: Sift dry ingredients together. Add shortening and butter into dry mixture, mixing with a pastry blender or a fork until the mixture looks like oatmeal. Beat the egg slightly in a measuring cup and add enough ice water to make ½ cup fluid. Pour egg and water into the flour mixture and mix well. Roll out the dough on a board or countertop dusted with more flour. If the dough seems sticky, sprinkle the surface of the dough and the rolling surface with more flour. To make piroghi (large pie): Roll dough into a rectangle approximately 24 inches x 16 inches. It is ready for stuffing. To make pirozhki (small pies): Take eggsized balls of dough, flatten, and roll out. Repeat with remaining dough. The small pies are now ready for stuffing. Make filling: Remove the tough outer leaves from 2 heads of cabbage, and cut the heads into quarters, removing the tough core. Chop the cabbage leaves finely. Mix cabbage with salt in a bowl and let stand for 15 minutes. Pour the cabbage into a colander in the sink and drain. Heat 4 cups of water to boiling and carefully pour boiling water over the cabbage in the colander. Let drain. Next, melt the butter in a large skillet and add the chopped onion. Sauté until softened (about 5 minutes). Add the drained cabbage to the skillet and continue cooking, stirring frequently with a wooden spoon, until the cabbage is soft (about 30 minutes). While the cabbage is cooking, remove the shells from the hard-boiled eggs and chop the eggs. Add dill or parsley and chopped eggs to the cooked cabbage and cook for 2 or 3 minutes longer. Remove from heat. To assemble piroghi: Transfer the dough rectangle to the greased cookie sheet. Spread the cabbage mixture over ½ the dough, fold the dough over and pinch the edges together. To assemble pirozhki: Fill each pirozhki with about 1½ Tablespoons of the cabbage mixture. 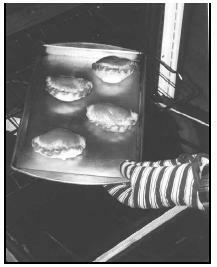 Pinch edges together and place on a greased cookie sheet with the seamless edge up. Bake the piroghi for about 30 minutes, until golden. Bake the pirozhkis for about 15 minutes. Pirozhki (small pies) may be filled with fish, cheese, jam, cabbage, mushrooms, chopped hard-cooked eggs, or meat. These pies are served alone or with soup at lunch. The Russian Orthodox Church celebrates the New Year on January 1, Christmas on January 7 and Epiphany on January 19. At New Year's, Ded Moroz (Grandfather Frost), a character from folklore, may be seen at holiday events distributing pryaniki, a sweet cookie to signify wishes for a sweet new year. The Russian equivalent for Mardi Gras happens during Maslyanitsa (Butter-week) when bliny are eaten nonstop. For Easter, Orthodox Russian women bake cakes and decorate them elaborately to resemble the rounded domes of the Orthodox churches. The cakes are given either to the priest on Easter Sunday, or served at home. The Easter bread is always cut lengthwise instead of in vertical slices. Pashka , a cold mixture of soft cheese ( tvorog ), butter, almonds, and currants, is formed in a special mold shaped like a pyramid with the top cut off to represent the tomb of Jesus. Russian Easter eggs are often colored red to signify the resurrection of Jesus. This is done by hard-boiling eggs with either red onion peel or beets. Roast pork is served for the main meal at Easter. A roast goose is traditional at Christmas. Put cream cheese into a large mixing bowl and beat until very smooth. Add butter and continue beating until well mixed and very smooth and creamy. Add sugar, a little at a time, beating well. Add vanilla. Add currants and toasted almonds and stir gently to combine. If flowerpot is not being used to mold pashka, pour cheese mixture into a pie pan, cake pan, or other serving dish. Smooth the top surface, cover with plastic wrap, and refrigerate at least two hours, until ready to serve. To use flowerpot mold: Line the flowerpot with the fabric, smoothing it to line the surface of the pot. Transfer the cheese mixture to the flowerpot, pushing the mixture down to remove air pockets. Fold the fabric over the top, and place a small saucer on the top to weight down the mixture. Refrigerate on a plate (some liquid may leak out of the hole in the bottom of the flowerpot) for at least two hours. To serve, remove saucer, unwrap fabric, and put a serving plate over the flowerpot and turn it upside down to unmold. Carefully remove the fabric. Measure the water into a large pot and heat until the water boils. Stir in jam, honey, ginger, cloves, and cinnamon. Simmer, stirring constantly, for 5 minutes. Ladle into mugs and serve hot. Russians eat four meals a day, starting with zavtrak or "morning coffee." Lunch, or obyed , is a small two-dish meal lasting from 12 noon until 1 p.m. Usually kasha, or baked buckwheat, is served at lunch. Dinner, or uzhin , is the most elaborate meal beginning at 6 p.m. and typically featuring four courses. The first course is zakuski or "little bite." Zakuski may feature a few simple appetizers (such as bread and cheese or herbed butter) to twenty or more elaborate creations requiring hours of preparation. 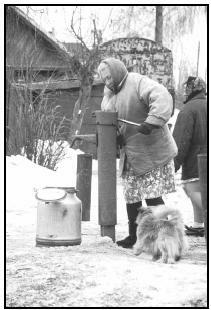 In some rural areas people must get their fresh water from an outdoor pump. Selodka, or herring with a vinegar and oil dressing, is the best-known appetizer, and it almost always makes an appearance during the zakuski. The first course is often soup, although soup may also be the entrée. Favorite soups include borscht (beet soup traditionally served with sour cream); shchyee (cabbage soup); and solyanka (a tomato-based chowder). The main course may be roast meat, with potatoes and root vegetables. Dessert may be ice cream or cheesecake. A few hours after dinner, usually around 9 or 10 p.m., Russians have their fourth and final meal of the day, centered on the samovar (ornate urn for serving coffee or tea) for tea and cakes, such as Sharlotka (Apple Cake). Visitors are encouraged to drop in for tea at night, sometimes staying until midnight. Restaurants often end the meal with Klyukva S Sakharom (Frosted Cranberries). Prepare onions and carrots by chopping them. Pour a little vegetable oil into a skillet and add the carrots and onions. Cook until softened, and set aside. Peel the beets and chop or slice both into small bite-sized pieces. Remove the seeds from the green pepper and chop. Put the chopped beets and green pepper into a small saucepan and add about ½ cup of broth and the tomato paste. Cover the pot and simmer the vegetables for about 30 minutes until the beets are tender. While the beets and peppers are cooking, pour the remaining broth into a large saucepan and heat it almost to boiling. Chop the cabbage and add it to the broth. Peel the potatoes, cut them into bite-size pieces and add to broth. Add cooked onions and carrots to broth. Simmer the soup for about 20 minutes. When the beets are tender, add them to the broth. Add lemon juice, salt, sugar, parsley, and garlic cloves. Simmer 10 more minutes, and serve hot, with a dollop of sour cream in each bowl. Combine flour, sugar, and eggs, beating well to completely dissolve the sugar. Wash the apples, cut them into quarters, and cut away the core and seeds. Cut the apples into thin slices. Grease a round cake pan and dust it lightly with flour or plain, unseasoned white bread crumbs to prevent the cake from sticking. Arrange all apple slices on the bottom of the pan. Pour the batter mixture over the apples, spreading it gently with a rubber spatula. Bake for 25 minutes until a toothpick, inserted into the center of the cake, comes out dry and the cake is beginning to pull away from the edges of the pan. Cool 10 minutes on a wire rack. Run a knife around the edges of the pan, and place a serving plate over the pan. Invert the pan (turn the pan upside-down) onto the serving plate. May be served warm or at room temperature. Preheat the oven to 150°F (lowest setting possible). Beat the egg white with an electric mixer or wire whisk until foamy but not stiff. Rinse the cranberries in a colander, discarding any shriveled or spoiled berries. Pour the cranberries into the egg white, stirring gently until the berries are all completely coated. Measure the sugar into another large bowl. Add the cranberries, and toss until the berries are completely covered with sugar. Spread the cranberries on a shallow baking pan, such as a cookie sheet, with edges. Bake for about 12 minutes until the sugar has melted. Spread a 2-foot long piece of wax paper out on the counter or table. Spread the cranberries out on the paper, separating them, to dry. Leave them undisturbed overnight. The frosted cranberries will keep in an airtight container or plastic bag for 2 weeks. Historically, when guests first arrived at a Russian home, the hostess welcomed them with a loaf of bread and a small amount of salt. The guest was expected to take a piece of the bread, dip it in the salt, and eat it. This explains the Russian word for hospitality, khlebosol'stvo ( khleb "bread" and sol "salt"). The hostess sits at the head of the table with the most respected guest at her right. Her husband sits where he wants to sit. Melt the butter in a bowl in the microwave or in a skillet over low heat on the stove. Toss the seeds in the butter, coating them well. Spread the seed on a cookie sheet. Chai Po-Russki (tea) is usually served with a variety of cakes and candies. 1 teaspoon loose black tea per person, plus 1 teaspoon "for the pot"
Measure tea into a saucepan. Add water and cardamom and bring to a boil. Remove from heat and allow to steep for 2 minutes. Pour tea through a strainer into cups. A meal might consist of borscht (beet soup) with bread and pickles, or could be more elaborate. The soup must be served very hot. All dishes are served at the table from large serving dishes. It is proper for the hostess to encourage her guests to eat more than they really want to eat. Lining many city streets are vending machines selling gazirovannaya voda (sparkling water), not in cans or bottles, but dispensed into a glass. The machine includes a scrubbing brush with cold water for the customer to use to clean the glass before using it. Also readily available are sunflower seeds sold by vendors at open stalls from large burlap sacks. Many Russians snack on sunflower seeds daily. 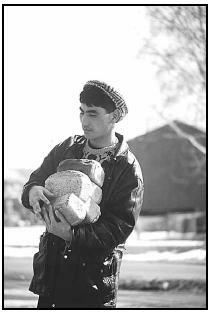 At the beginning of 2001, Russians continued to struggle with shortages of some food items. According to a World Bank report, about 3 percent of children under age five are underweight, and about 13 percent have not grown to the appropriate height for their age. These are both signs that a small percentage of young children in Russia are not receiving adequate nutrition from their daily diet. Goldstein, Darra. A La Russe: A Cookbook of Russian Hospitality. 2nd ed. Montpelier, VT: Russian Life Books, 1999. Kropotkin, Alexandra. The Best of Russian Cooking. New York: Hippocrene Books, 1997. Toomre, Joyce. Classic Russian Cooking: Elena Molokhovets' A 'Gift to Young Housewives.' Bloomington, IN: Indiana University Press, 1992. Visson, Lynn. The Russian Heritage Cookbook. Dana Point, CA: Casa Dana Books, 1998. Volokh, Anne with Mavis Manus. The Art of Russian Cuisine. New York: MacMillan, 1983. Russian Foods. [Online] Available http://www.russianfoods.com/ (accessed January 31, 2001). Zina's Cookbook. [Online] Available http://www.russophile.com/cook/index.html (accessed August 17, 2001). The guy which carried unwrrapped loaves of bread barely look like russian because he is not.And it is not really uncommon for russian family to eat that mach of bread. Russian family dont eat so much bread. Maybe one loaf for family of 4-5. Sometime even less because they eat pirogky made with flower. Your information about dinner is not correct. I grownup in Russia and biggest meal of the day was around 1-2 pm. The dinner was small and contaned only one dish meal. Only on Holliday's russian serve bigger meals on dinnertime. You confuse Russian hospitality with regular living. It is much healthier eat less for dinnertime anyway. Obesity wasn't a big problem in Russia.